Russian President Medvedev is in South Ossetia for the first time since it declared its independence from Georgia, on a visit to see how the republic is recovering after being attacked by Georgian forces last year. Russia was the first country to recognize South Ossetia as an independent state. Medvedev got a traditional Ossetian welcome, which included savoring local food and wine. The Russian leader thanked South Ossetian President Eduard Kokoity for the invitation and assured him that cooperation between their countries will continue. “I am very grateful to you for inviting me to a new country, South Ossetia, which emerged as a result of dramatic events and which the Russian people supported in a difficult time,” said the Russian president. He stated that Russia and South Ossetia “not only have a common past but also a solid legal base,” including several agreements. For his part, Kokoity thanked Russia for its efforts in last year’s conflict. Despite South Ossetia proclaiming itself a sovereign state, the UN has refused to recognize the country’s independence. After the devastating conflict, which killed hundreds of people, Russia was the first to help rebuild the republic. Moscow allocated almost $400 million to South Ossetia and dispatched a huge force to help restore the region. Medvedev promised that Moscow will continue security cooperation with Tskhinval according to agreements struck in April, in which Russia pledged it would help South Ossetia protect its borders. 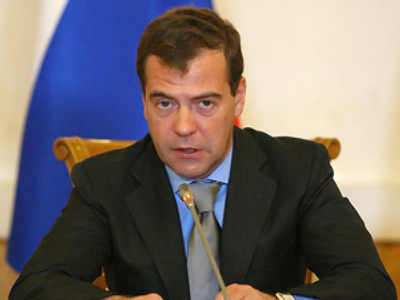 Russia's forces are deployed in the region and Medvedev visited its military base in the capital. Having protected the citizens of South Ossetia last August, as well as having signed a cooperation agreement, Russia is continuing to fulfill its obligations here. The unexpected visit of the Russian leader has strengthened hope among South Ossetians for a better life.